Why is there a need to feed rumen buffers? Typically 80% of the cow’s energy needs and 70% of her protein requirements are supplied by the rumen microbes from the feed that she consumes. This complex eco-system transforms the energy sources in the feed into organic acids, predominantly acetic, proprionic and butyric acids. The acids are absorbed through the rumen wall to be metabolised in the liver to meet the cows energy needs. on the fibrous nature of her diet and how long she spends resting, ideally half of her day. To meet the huge energy requirements of the modern dairy cow, especially in the early weeks of lactation, diets require high levels of starches and sugars.The populations of microbes that digest these soluble carbohydrates can multiply very quickly and produce large amounts of lactic acid. Other microbes that utilise the lactic acid are unable to respond quickly enough to metabolise these high levels, leading to the rumen buffering mechanisms being over-whelmed and the rumen pH falling below 6. This depresses the function of the microbes needed to digest the forage component in the diet. Once the rumen pH falls below 6, Sub Acute Ruminal Acidosis (SARA) can trigger serious consequences for milk production and animal health. Good diet formulation can go a long way to reducing the risk of SARA depressing herd performance and animal health. However many other factors can influence rumen function including forage quality, diet processing, feed allocation and feeding facilities. For just a few pence per day, Ostrea® can balance the rumen environment to help keep the microbes working, thus maintaining the high energy and protein supply. Ostrea® Seashell and Oyster Shell Flours are a source of chalk derived from natural shell banks in the North Sea. The shells are washed, dried and heated and then ground into a powder. Ostrea® is not just a rich source of calcium carbonate, but also contains a wealth of other minerals. Ostrea® is held in high regard by dairy farmers in Holland, Belgium, and France who have used the product as a rumen buffer for many years. a volatile fatty acid, twice the capacity of sodium bicarbonate. Because the molecular weight of calcium carbonate is higher than that of sodium bicarbonate, in practice this means Ostrea® is able to buffer 150% more acid than the same weight of sodium bicarbonate. Ostrea® flour also has unique physical characteristics which make it an ideal rumen buffer. It has a large surface area and complex honeycomb structure and combines high availability in the rumen witha sustained action. Other rumen buffers can cause a rapid rise in rumen pH taking the pH above the 6-7 range in which the microbes work most effectively. 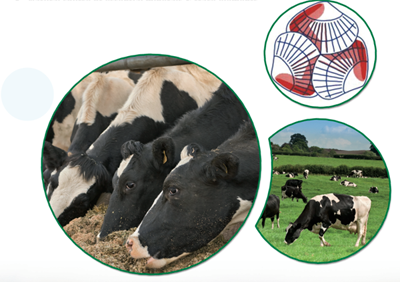 Ostrea® has a natural ability to minimise wide fluctuations in rumen pH but cannot over-buffer the rumen, making it very safe to use across the whole herd at all stages of lactation, whilst also contributing to the cows’ calcium and trace element requirements. In recent laboratory trials separate model rumens were loaded with organic acids to mimic pH conditions in a real life rumen. They were than buffered with four commercially available products; sodium bicarbonate, product A, Ostrea Seashell Flour and Ostrea Oyster hell Flour, at the equivalent of commercial doses. The pH was monitored over a period of up to four hours . The model rumens were subjected to acid loading to simulate post feeding rumen conditions in cows fed TMR diets and then higher levels of acid as experienced after twice daily parlour fed concentrates. Each time the pH was then monitored for up to 90 minutes. The results sdemonstrate Ostrea’s® superior buffering ability to sustain the pH within the optimum range of 6-7 for good rumen function, without causing an initial “alkali” shock.